The historical novelist Anne O’Brien recently wrote that Joan (or Joanna) of Navarre (Juana de Navarra in Spanish) was a queen who was “more invisible than most”, but that’s an unfair verdict. Joan was not only long-lived but the consort in two realms and twice a regent. Joan was born on 10 July 1370 in Pamplona, Navarra, and died on 9 July 1437 at Havering-atte-Bower, Essex. She was Duchess consort of Brittany and Queen consort of England. Joan was the regent of Brittany from 1399 until 1403 during the minority of her son John and briefly regent of England when Henry V was in France during 1415. A member of the Evreux family, she was a daughter of Charles II of Navarre and Joan of Valois. Aged 16 she first married the 30-years-older John IV Duke of Brittany, who had two English wives before her, at Saillé-près-Guérande on 2 September 1386. She had nine children of this marriage: four sons and five daughters. The eldest, John V, inherited the dukedom when his father died on 1 November 1399. Joan was the regent of Brittany from 1399 until 1403 during his minority. Years later, her second son, Arthur III, succeeded his nephew. On 7 February 1403, she married Henry IV at Winchester Cathedral and was crowned at Westminster Abbey later that month. They had married by proxy a year earlier at Eltham Palace. It appears that the marriage was by Henry’s choice rather than for dynastic reasons. Henry Bolingbroke had met Joan, reputedly very beautiful, while in exile at the Breton court in 1398-9. Although their marriage did not produce any offspring, Joan got along with her stepsons. She even sided with the future Henry V in arguments with his father. Henry IV died in Westminster on 20 April 1413, after 10 years of marriage. From 1405 onwards, Henry suffered from debilitating illness, possibly a form of leprosy, and was cared for by his wife. Joan’s marriage to Henry was not welcomed at the Breton court and, when she came to England, there was opposition to her and her followers from France, as well as complaints about her dowry and the amount of income bestowed on her by Henry from royal sources. Despite her good personal relationship with Henry V, she was accused of plotting to kill him through witchcraft and imprisoned in comfort at Pevensey Castle in Sussex and then Leeds Castle in Kent for four years (1419-22). All her properties were confiscated. At the trial, a friar-confessor testified against her. Tension may have built between the king and his stepmother after her son Arthur was captured at Agincourt in 1415 and held as a hostage in England until 1420. In spite of her pleas, Henry refused to free Arthur. Joan’s father Charles II of Navarre (who later gained the epithet of ‘the Bad’) had a reputation for necromancy and poisoning opponents and she had great interest in astrology. The factors of “like father, like daughter” and Henry’s need to rebuild his treasury for wars in France may have come together in the charges against his stepmother. She was released shortly before Henry V’s death in 1422 and her assets returned. 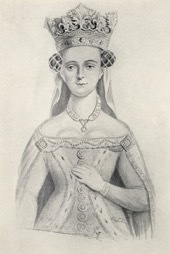 Joan lived a quiet, comfortable life with her court at Nottingham Castle for the brief residue of Henry V’s tenure and for nearly 15 years of the reign of his successor Henry VI (1422-1461), who gave her a state funeral in 1437. Despite her experience in Brittany, the queen did not play a part in the regency of her step-grandson, who succeeded his father at just nine months old. Joan died at the age of 66 and was buried in Canterbury Cathedral next to her husband. Joan’s marriage to Henry IV at Winchester in 1403 is celebrated in part of a late 1930s stained glass window in the north aisle of its Cathedral. Crowned and golden haired, she is dressed in an emerald green gown in a palace with the Pyrenees in the distance. My co-researcher for this blog is Dr Natalia Rodríguez-Salcedo of the Universidad de Navarra, Pamplona.